(01.12.2015) In a joint action War Resisters’ International, Connection e.V. 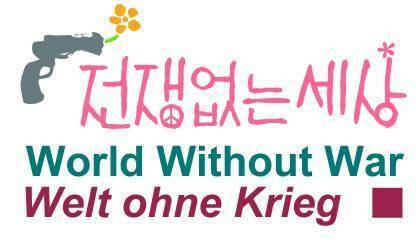 (Germany), Amnesty International Korea and World Without War (South Korea) today presented more than 8,000 signatures from 108 countries, including members of parliaments from Germany, European Union and South Korea, to the ministry of defense in Seoul, the capital of South Korea. The organizations demand the recognition of conscientious objection and the immediate and unconditional release of conscientious objectors in prison. (13.05.2015) Every year South Koreans are sent to prison for exercising their freedom of thought, conscience or religion or belief. 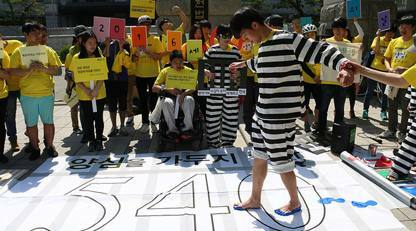 Over 613 conscientious objectors to military service – that is, men who have refused conscription for reasons of conscience – are currently in prison in the Republic of Korea (South Korea). 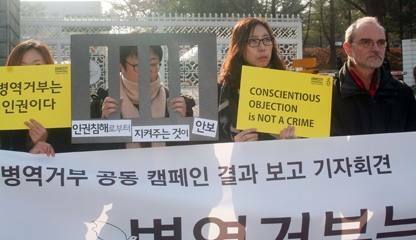 This briefing paper on conscientious objectors in South Korea includes information gathered in South Korea in October 2014 and January 2015 when Amnesty International interviewed ten conscientious objectors, their families, lawyers, scholar, religious organizations and civil society organizations working with conscientious objectors.